I am glad it turned out well in the end. :-) You guys are brave to take the kids....I think I would have chickened out. Although my girls are finally getting to the age that they can (sometimes, when they decide to) control themselves. So what is your song? Wow! 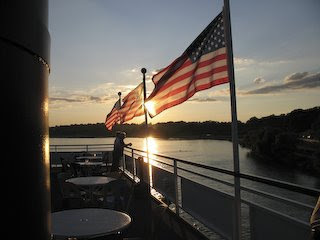 It must be a wonderful experience to take a dinner cruise on the Mississippi. I am glad it turn out well at the end. It is very sweet. Sounds like you had a wonderful time! My wife and I always wanted to do something like that, this story gives us a little motivation to actually do it! What a wonderful evening! You take terrific pictures, and if it only takes 15 to get a good one, you are doing 200% better than me. That was so romantic and sweet and funny! Thanks for all the sweet comments! It was a wonderful night.